The Rant at GDC is a chance for developers to air their grievances with no boundaries on decorum, but, instead of railing against "the man," two developers told why it was their fault that they failed. Paul Bettner was at Ensemble Studios when they were at their best and worst. He was there when Age of Empires received multiple Game Of The Year awards in 1998, and he was there when Microsoft fired the whole studio 10 years later. But he doesn't blame Microsoft, he blames himself for allowing a culture of crunch and inefficiency to continue even when he knew it was wrong. Similarly, Justin Hall rode a high of venture capital investment before he realized that his game and company couldn't sustain itself. "I started off as a journalist, I became a student developer of games, and then I had the chance to run my own studio into the ground," said Justin Hall to open his rant. He had an idea to make a browser-based MMOG, at first called the Passively Multiplayer Online Game but later The Nethernet, where you create quests and leave treasure and bombs on websites for your friends to find. Hall built a working prototype while he was at USC for game design and around 1500 gamers seemed to the think that it was really fun. "People said, 'Wow that's a functioning prototype with 1500 users of a new type of game. It's 2007 and we're all smoking the happy weed here in California, let's give you some money to make this real!" Hall said. Even though he was still a student, Hall couldn't resist the $2 million that was thrown at him to start his company. Fast forward two years and the game launched, but it was only generating $25/month while he was spending $75 thousand to keep his company running. Seeing that this was quickly going to fail, he crunched to make two Facebook games, Dictator Wars and Super Cute Zoo. "We were now making $50 a day, we doubled our revenues, we were up to $1500 a month but we still had about five employees and we were still burning about $75k a month," he admitted. "I was the CEO. I failed. I wasted time," he said. Instead of searching for cheap printers and chairs to save money, "I should have been market-testing my fricking Firefox MMOG" that no one wanted to pay for. Finally, "I had many people, people who might be in this room, tell me that I should do these things and I didn't listen to their advice because I had this picture of the game I wanted to build in my head. And we built it, but nobody came." "I didn't make a market-ready product that could sustain the company." Hall said he spent a lot of time being depressed and sad at his failure and how it was all for nothing. 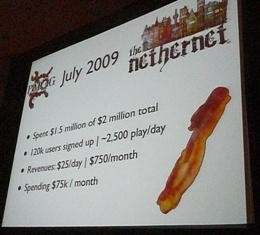 But the story isn't all bad: he's releasing the backend of the The Nethernet to the world as open source. "So if you want to build a toolbar MMOG in Firefox, later this month you can go crazy," said Hall to end his rant. Paul Bettner from Ensemble Studios tells a much different story of great success and ultimate failure that stemmed from a problem that plagues many design studios these days, the culture of crunch.